Composites and pultrusion; The pultrusion process; Profile design, specification, properties and related matters; Thermoset resins for pultrusion; Reinforcements for pultrusion; Pultrusion applications – a world-wide review; Infrastructure – a positive market; The future – beyond 2000. Pultrusion for engineers is a comprehensive overview of the latest developments and applications for this growing and increasingly important area of the fibre reinforced plastics industry. Trevor Starr is well known as a specialist consultant with many year's experience in the FRP world. He has assembled an international panel of distinguished experts to provide the widest possible coverage of the state-of-the-art in novel pultrusion applications and development including many leading US researchers such as Brandt Goldworthy, regarded by many as the father of modern pultrusion. 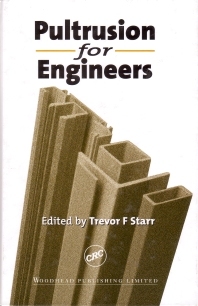 Because this book is one of very few to cover pultrusion, it is essential reading for industrial producers of pultruded profiles, chemical companies producing resins and composite materials specialists eager to reach the new markets in, for example, civil engineering that are rapidly being opened up to design solutions involving pultrusions. Trevor Starr is a Chartered Engineer, Fellow of the Institute of Materials and Principal of Technolex an internationally renowned independent composites consultancy practice which he established in 1978. He has recruited contributors from Western Europeand the USA who collectively possess many years hands-on experience of designing and manufacturing pultruded profiles for a wide range of civil engineering projects and structural applications.